At My Credit Guy, one of the questions we get most frequently is how to increase a credit score quickly. Many of our clients need to improve their credit score to qualify for a home mortgage, auto, or other financial loan. With a poor credit score, this can prove to be very difficult. Luckily, there are some proven strategies when it comes to improving a credit score — and, of course, doing it quickly. Watch our CEO, Sam Parker, explain how to fix your credit in the video above. 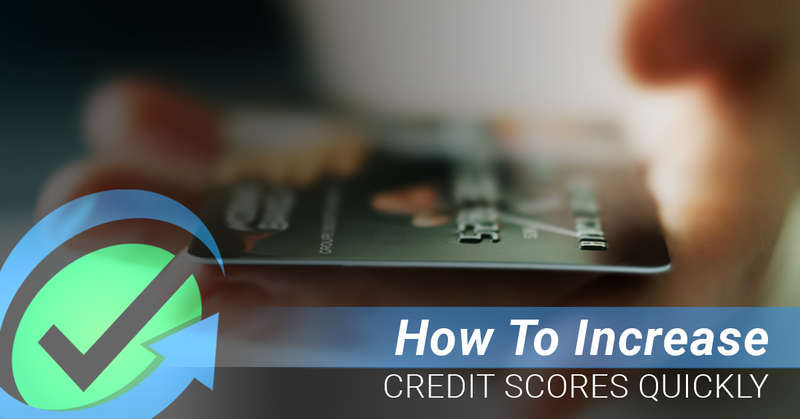 The fastest way to improve your credit score is to pay down your credit cards. While this is logical, that doesn’t mean it is easy. After all, how do you pay down your credit cards if you don’t necessarily have the resources? To save money, it makes the most sense to pay down your highest interest cards first. However, when it comes to how to fix your credit, achieving a good balance-to-limit ratio is the way to go. Your balance-to-limit ratio is the difference between the amount you owe on your credit cards versus your credit limit. 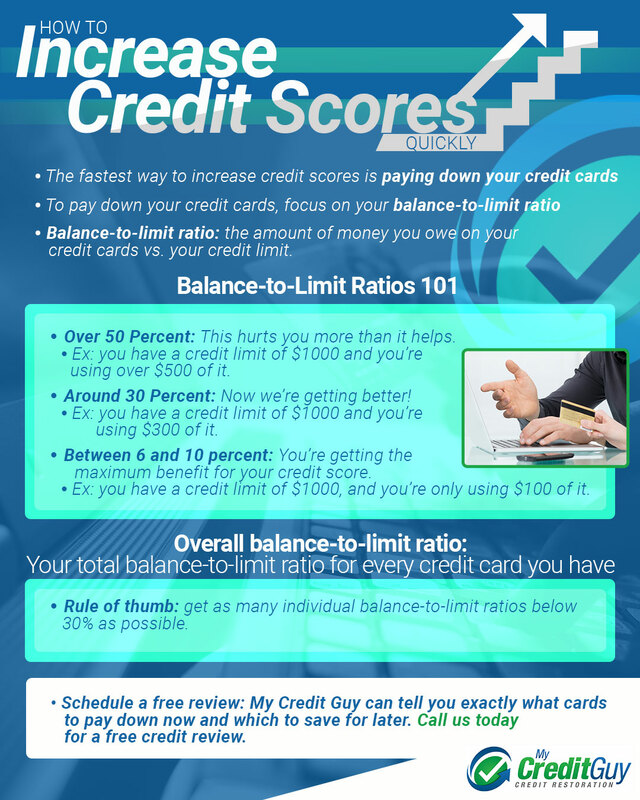 So, if you have a credit limit of $1,000 dollars and you are using $500 of that limit, you have a balance-to-limit ratio of 50 percent. To improve your credit, you ideally want a balance-to-limit ratio of between 6 and 10 percent. As you work to pay down your credit cards, though, a more realistic goal might be 30 percent. At this point, your credit cards at least aren’t actively hurting you like they are with higher ratios. Just as you have a balance-to-limit ratio for individual credit cards, you also have an overall ratio for every one of your cards combined. This metric is important. You want to achieve an overall ratio around 30 percent or lower. If you fall into some cash, your tendency might be to pay down your biggest outstanding balance. However, it’s much smarter to pay down smaller credit card bills so that their balance-to-limit ratios are at zero. This improves your overall balance-to-limit ratio. In general, the best rule of thumb is to spread your money across as many cards as you can. To see helpful graphs explaining these concepts, be sure to check out our video above! Improving your credit can be really overwhelming, especially if you have multiple credit cards with outstanding balances. Scheduling a free review with a credit restoration company is extremely beneficial. Since it’s a free review, it at least can’t hurt. Most of the time, these free reviews can point you in the right direction and tell you which cards to pay down. If you’ve been wondering how to fix your credit, this is it. Contact My Credit Guy today for a free review.